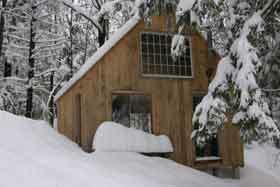 Welcome to Husky Works.com, the home of Husky Works Mushing Co. Here at HWMC we are looking forward to another fun and exciting winter with an opportunity to share our passion for dog sledding with others. We have been getting some calls already for the upcoming season so remember to book early! It has been nice and cold here in the Green Mtns. recently and we are looking forward to a long and snowy 2018/2019 winter here at Husky Works! Remember to try and book in advance for the best chance to get the date and time you are looking for. We look to seeing you all this winter! Click here to learn more about our rides. 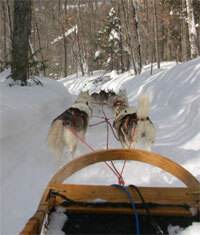 Dog Sled Adventures in Southern VT! Experience winter as never before. 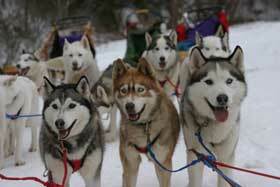 Be pulled by a team of Siberian huskies on the ride of a lifetime. 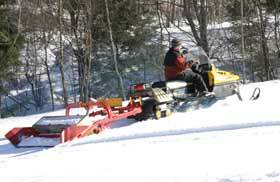 Join us for a cozy ride in one of our hand crafted 2-3 passenger sleds. 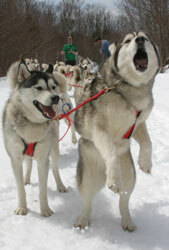 Husky Works Mushing Co. offers rides Wed., Fri., Sat., & Sun. at 9:30am and 12:30pm by reservation only. Getting ready for winter 2018! Winter has arrived and the dog sledding has been great. 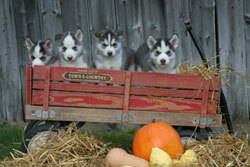 Come visit the dogs at Husky Works this winter and go for a ride in the southern Green Mtns. Let's hope for some more snow like this! Come on guys, let's get going! Sadi was one of our main lead dogs and was always ready to get the team going! When we run our dogs for fun and in training we never want to leave anyone behind. 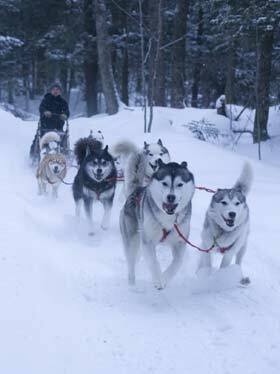 There for we often run teams anywhere from 6 to 14 dogs depending on the number of sleds we are running. 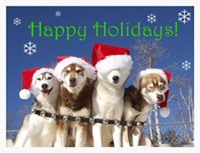 Take a look at some of our dog sledding adventures over the years. Over the years we have had a few litters and we usually keep them all! When there are puppies around, there is rarely a dull moment. Take a look at the litters we have had and some of our dogs as puppies! 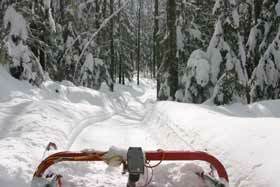 How we groom the trails!